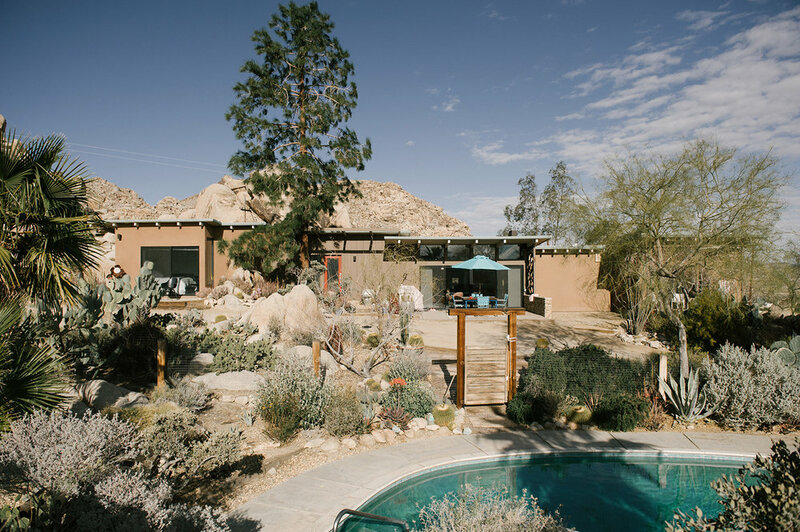 This sprawling estate is nestled among the boulders on a hill overlooking the vast valley of Joshua Tree. 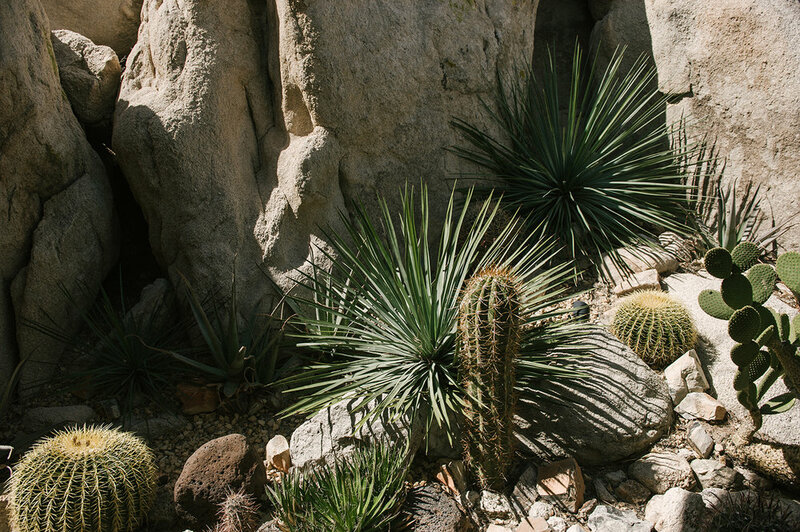 Surrounded by mature gardens of cactus, palm trees and a plethora of desert plants, the main house, casita and pool feel like a true oasis. 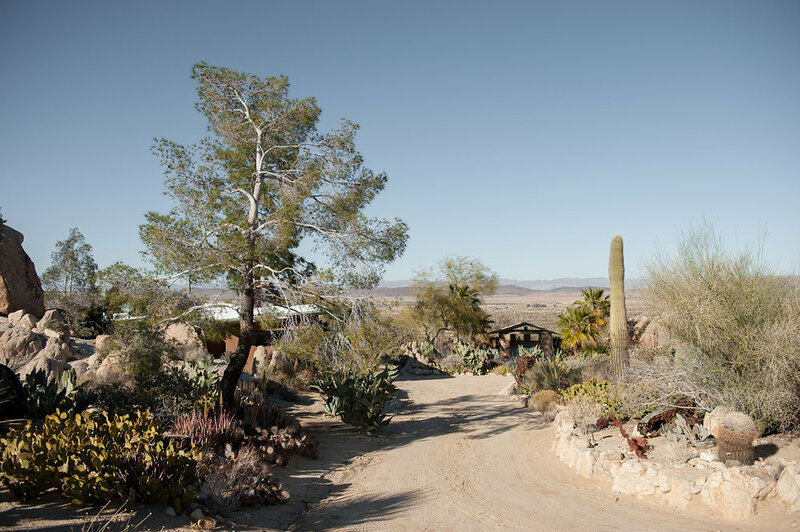 Just minutes from Joshua Tree and the west entrance to Joshua Tree National Park, the property feels removed and private, yet is close to all the conveniences. 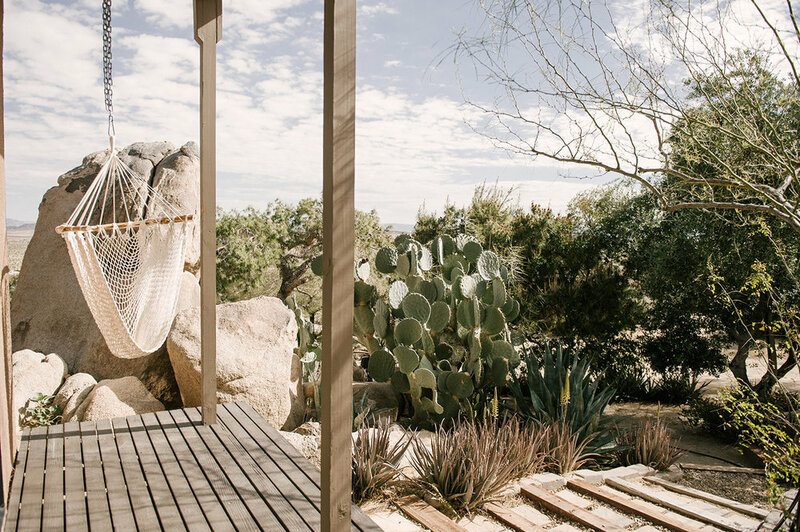 With 3 rooms in the main house and a casita with an additional bedroom, bath, living room and kitchenette, it's the perfect place to experience luxurious desert living with friends and family. Waking up to your first sunrise hitting the spectacular desert valley, swimming in the turquoise waters, and watching the glow of the fire bounce off the ancient boulders, are just some of the special moments that will remain with you forever. 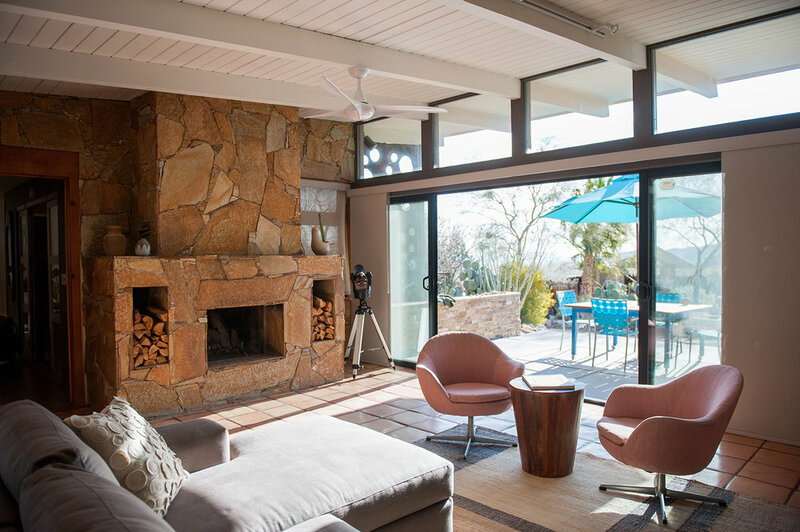 The main house is mid-century in style and consists of an open concept living space with fully equipped modern kitchen, living room and dining area. The master bedroom is off the main living area, and has a queen bed, ensuite bathroom, a private deck surrounded by boulders and landscaped gardens. The second bedroom is bright and light with a queen bed and desk with views of the boulder mountains and pool area. The third bedroom is charming in decor with a single bed. All rooms come with luxurious linens, and if there wasn't so much draw to be outdoors, you wouldn't want to get out of bed! Surrounded by landscaped gardens, the casita is tucked off the pool, with a bedroom, living space, kitchenette, bathroom and outdoor eating area. 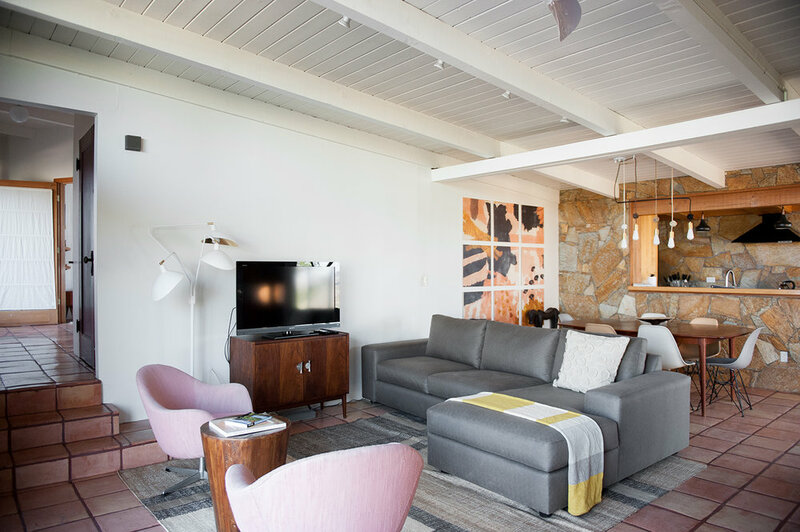 Decorated in true "Joshua Tree fashion", it has the feel of a stylish mid-century hideaway with a cool factor! The obvious highlight here is location location location. There are not many places to stay that are set right in the boulders with an expanse of hiking trails just steps away. 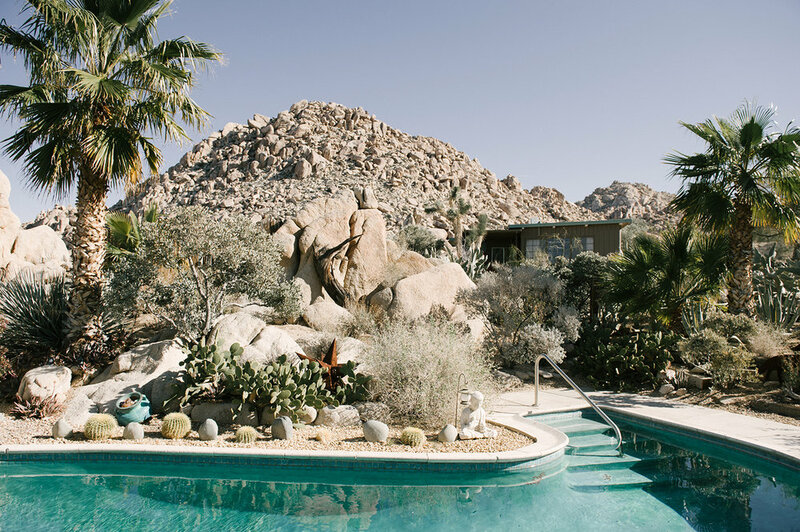 Another obvious highlight is the pool, another rare feature in the desert! Combine the pool and boulder location and this becomes a one of a kind experience! 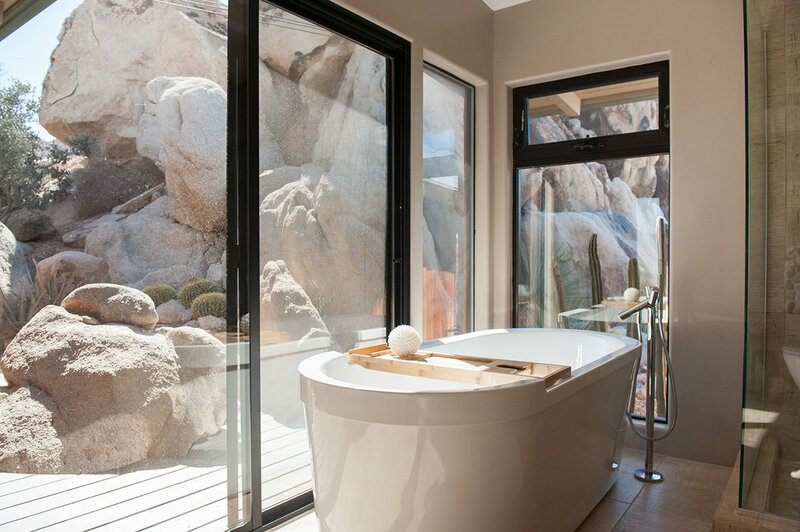 The main bathroom was designed with true relaxation in mind by adding a large soaking tub and glass walls to take in the gorgeous gardens and boulders. We recommend waiting until mid-afternoon when the light streams in and creates a true sanctuary. The owners have made a huge effort to make this a great escape for families with young ones by supplying everything one would need: toys, play mats, white noise machine, baby monitor, bottle sanitizer, kids plates and utensils, high chair, pack n play, hiking backpack, infant tub, and more! Rates start at $400 for 2 people during the week and go up to $1,000 for 8 people on weekends and holidays. There are a few stairs in the main house, and the adjoining areas are unsuitable for wheelchair access.